The EQ and IQ Debate: Which Is Better? Honestly, It’s the Wrong Question. The EQ vs. IQ debate is in full swing after Adam Grant’s latest article blasting the value of emotional intelligence. His critique is wrong, but important. Let’s take a deeper look at how he frames the relationship between EQ and IQ – and why it’s misleading. His latest post on LinkedIn, “Emotional Intelligence Is Overrated,” is a follow up to his Atlantic piece, “The Dark Side of Emotional Intelligence,” where he warns it’s risky to develop emotional competence. He even speculates that Hitler used emotional intelligence to manipulate people into a frenzy of mindless loyalty. He clearly sees EQ and IQ as competitors, and encourages everyone to choose IQ. Framing this as EQ vs. IQ demonstrates neither. At any meeting, any dinner table conversation, it’s obvious that these aspects of intelligence need to work together. The ability to conduct complex analysis is hobbled (and dangerous) without the ability to connect meaningfully with other human beings. The ability to sense and manage emotion is nearly useless without the ability make meaning from rational observation. Is it EQ vs. IQ? You are on one team or the other? No, it’s EQ and IQ, working together. Traditional psychological research has treated emotion and cognition as separate, even competitive. Grant perpetuates this myth with his recent arguments. But a lot of breakthrough research in neuroscience says something new, and powerful: Thoughts and feelings are interdependent. Emotional intelligence is an enabler of cognitive development. Looking at the fascinating body of neuro-learning research from Mary Helen Immordino Yang and other cognitive neuroscientists (see Medina’s Brain Rules for a good introduction), a new perspective emerges: at a neurological level, thinking and emotion work together. We don’t “think” with one part of the brain and “feel” with another; the process of learning is built into the very same neural circuits as the process of social-emotional interaction. For more on this, read Michael Miller’s article, The Myth of Keeping Emotions Out of It. That’s because in the human brain, no signal is more powerful than emotion. Emotion is a primary filter; it’s a signal of survival. Any high school teacher can tell you: Algebra can’t compete with love. There are no truly rational decisions. A growing body of neuroeconomics research shows that we even make decisions with emotion, then justify those with logic. Obviously, we’ll do a better job in that process if EQ and IQ work together. Science is a process of mounting evidence. Grant cites a couple of studies to support his opinion, but the real test comes from hundreds of studies that say something very different. While there certainly are studies that find EQ to have little value, and studies that find IQ to be essential, today Google Scholar lists over a hundred thousand studies on emotional intelligence, and the growing body of evidence links EQ skills to career success, school success, classroom behavior, stress management, leadership influence, employee engagement & performance, plant safety, change leadership, employee retention and even life success for professional athletes. 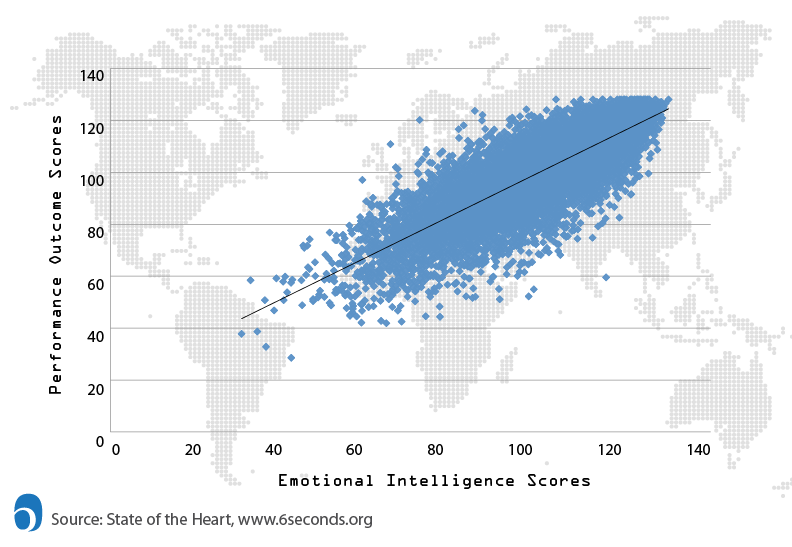 This year, for the first time, a “big data” approach was used to assess the significance of emotional intelligence around the globe. Using a random-sampling process from a database of over 75,000 people, Six Seconds created a sample that’s balanced across age, gender, role and region to publish The State of the Heart Report. Assessing both EQ and performance outcomes (e.g., effectiveness, relationships, decision-making). The result: Between 50-60% of variation in these performance scores are predicted by EQ. While Grant says EQ is unimportant on the job, The Business Case for Emotional Intelligence, The School Case for Emotional Intelligence, and scores of other case studies say otherwise. Perhaps more importantly, in real-world examples, in people’s daily lives, we can see emotional intelligence skills improve performance at work, in school, and in life. EQ and IQ: Is EQ More Important? None of this is to say that IQ is unimportant. In education and business we ALREADY focus on IQ. For the last century, cognitive development has been the primary goal of education: we have seen IQ scores increase by two standard deviations over the last century (that means a “somewhat smart person today” would be a “genius” in 1915). This “Flynn Effect” suggests (a) that IQ tests don’t actually measure intelligence, and (b) that around the world massive attention is given to cognitive development. Growing IQ is helping us in many ways (creating innovations such as tiny computers that can be inserted into our hearts). At the same time, all this attention to IQ hasn’t solved other of the world’s most pressing problems: from poverty to environmental destruction to divorce to war. In fact, people today are more stressed, more lonely, and therefore less able to solve problems. Here in Silicon Valley, you can throw a rock and hit a building full of uber-intelligent engineers. These people are painfully smart – they graduated or dropped out from the top universities, and they are only hired if they have good-to-scary levels of IQ. So now what? As Daniel Goleman explained in his rebuttal to Grant’s article, IQ gets you hired, but EQ gets you promoted. While Grant’s LinkedIn post is deliberately hostile (promotional intelligence? ), his Atlantic article has a more thoughtful and important point. Capabilities can be misused. Emotional intelligence is a tool. Can someone misuse it? Sure. A baseball bat is for play, but in the wrong hands it can kill people. Does that mean we shouldn’t learn how to play baseball? One can make the danger argument for any skill, but it doesn’t make it inherently dangerous. There is nothing inherently manipulative about understanding one’s emotions and using that understanding for better decision making. The only real path forward is wisdom. Intelligence is not enough. We need to apply intelligence with the discernment that comes from awareness and compassion. Our purpose at Six Seconds is to support people to create positive change. Change that ennobles and empowers self and others. It’s the essence of leadership, and it’s urgently needed. While we must have cognitive power, people are not just rational: the missing link is emotional intelligence. As a parenting educator, I’d say that 90% of my clients have challenges with their children because they don’t know how to emotionally connect and support their kids. In terms of raising children, I’d say that EQ is much more important than IQ. Research shows huge gender effects on valuing EQ. Men are hired for their IQ, even if they don’t have the best social skills. Women’s IQ is considered ONLY AFTER they meet an EQ threshold that is much higher than men’s. People are rarely good at both. Agentic, go-get-it women are perceived as lacking social skills and are often rejected in experimental interviews in favor of men with similar or lower social skills. So a building full of uber intelligent engineers may have 3% women in that function. Therefore this entire discussion needs to be framed in gender terms. Basically it’s IQ for men and EQ for women. My only issue about this is that, now, people are stressing too much about EQ that they do underestimate IQ. Like for example, they encounter someone with high IQ, they would just say, “so what, EQ is more important”. It now feels like as if IQ is not important. I am not saying EQ educators are saying IQ is not important, but this EQ thing is now misinterpreted badly by many, it comes to a point where they do this EQ vs IQ things. You need both. There’s no conflict between the two. Period. “You need IQ to get hired, EQ to get promoted”………….no you don’t, in both cases you need talent and the ability to do the job! The intellect is a comparative tool. It uses the standards of good/bad, right/wrong, and results from past experiences to determine right action. Depending on the value structure of the person and backed by their past experiences, they can be a credible participant who makes worthwhile decisions, maybe even 9 out of 10 times. Efficient thinking is a much needed skill. EQ opens the opportunity to increase effective decision making by widening the field of awareness to include the emotional climate of the present. Discernment requires a keen awareness of the present, since the point of power to choose always exists in the present. Leading with IQ is often timely and efficient and serves to be expedient in many situations. EQ is required to deepen, open to and strengthen creative and innovative solutions. Strong conceptual ability, IQ, sets the foundation for leaps of ingenuity allows us to move from a framework of good/bad, right/wrong thinking to the more expansive question of what is right action in this situation that will work both efficiently and effectively? The idea of an either/or approach to this question highlights the limits that an intellectual approach typifies. What appears from working with children shows very well the treasure of EQ. Since several years we know by research, children are more vulnerable to stress compared to adults. By offering them ways in ‘learing by doing’ exercises through EQ & SQ issues at school or elsewhere, stress melts quickly. As a result it enhances the rate / score of Cognitive Intelligence. Research, decennia ago at the University of California by Shaw, Rauscher and Leng (New Scientist 15 – 3 – 1997) showed that listening to music and even more playing music and singing made a much higher score to a maximum of 34% in Cognitive Intelligence abilities. Read about a clear research described in ‘The Master and His Emissary’ from Ian McGilchrist about the influences of the exchange of both Hemispheres. It can be summarised by Goleman et al. here: “We see intellect and clear thinking largely as the characteristics that get someone in the leadership door. Without those fundamental abilities, no entry is allowed. However intellect alone will not make a leader; leaders execute a vision by motivating, guiding, inspiring, listening, persuading, –and, most crucially, through creating resonance. As Albert Einstein cautioned, “We should take care not to make the intellect our god. It has of course powerful muscles, but no personality. It cannot lead, it can only serve.” Goleman, D., Boyatzis, R., & McKee, A. (2002:27). Primal leadership: Realizing the power of emotional intelligence. Boston, MA: Harvard Business School Press. Being around people with high to extremely high IQ, (Silicon Valley!) I know that they may use their IQ anywhere from improving the world, making money, helping individually to…… Using their abilities to suppress people with either less power, money, education or by exploiting them to get random things in life. No doubt, they succeed in either of catageories but they are LOW on EQ to understand after effect of their action and inspite of them being selfish, they can not understand that they will eventually fall into their own mess. When they fall in mess, they not only ruin their own life but several others around them including family, friends and community member. Sometime they don’t even live long enough to see all this and sometimes they do get away with it. Imagine if there was a tool to just have them see final results. Then …..
It’s not EQ or IQ would stop them but it’s inner instincts ( nature / nurture !? ). So question is … Can a training institute change what is given to them by nature or nurture. Intelligence (IQ) is undoubtedly the genetic lottery that is getting better with every consecutive generation. The academic focus has clearly put the importance on IQ as the ruling power to get a good placement after obtaining a few degrees. Woww….That’s wonderful…But then there are many times when the individual cannot work in groups, has poor relationship skills and lacks empathy. Unfortunately, many of those in the workplace are in the wrong jobs! This is because their IQ has helped them get the jobs that may be high profile, but their heart is not there in what they do. Hence, they may be low on motivation and not passionate about what they are working on. Believing in the multiple intelligence theory, we all have a few dominant intelligences from the 8 stated ones. Taking the thread from there, when we speak of intra personal and interpersonal, leading to Emotional Intelligence, the neuroscience also reconfirms that the brain stem is covered with the emotional brain first and then the thinking brain. Establishing a connect between the two enhances both the intelligences and compliments them. I work very closely with children in various age-groups. Introducing activities to enhance their EQ skills like emotional literacy, emotional self-awareness, impulse control, delaying gratification, navigating through emotional distress, optimism, empathy, relationship skills, etc have made a lot of difference to their lives. A blend of both the skills is of utmost importance to a better mental, physical and emotional well being. When nature (the way human beings are created) has not shown any discrimination between IQ and EQ, is it not worthwhile to spend more time in enhancing the missing piece? I tend to have strong emotional reactions when reading anything on this website, I have two major emotions that I exhibit: Fear and Anger. When I try to read certain articles my fear comes out and I can’t see the forest for the trees and Adam Grant’s article brought out the fear in me because I immediately thought any movement forward in EQ will be stopped (which is highly unlikely). He brought up Adolph Hitler (who in my opinion was psychopath),Grants writes that Hitler had to “master emotions”. He did so because he was devoid of any himself. I think personality disorders are a different case, there are many personality types who are very manipulative and will survive until cockroaches die. EQ can’t really be held responsible for those people, at this time there is nothing we can do about psychopaths, narcissistic personalities, and the like. They exist and no one really knows why. What I come away with in “studying” EQ is that “We need not dwell on the dark side but try and come out into the light”, that comes from somewhere but I have no idea who said first. Yesterday at Dreamforce I took the Inside Sales test that predicts how likely a sales person was to hit quota (I got 113%). The scores that it gave were in things like Empathy, Resiience, Ambition. The questions were almost ALL around EQ types of things. There were a few that asked about how quickly I learn new things. There were more that asked about curiosity. This would indicate to me that based on the extensive research that drove the creation of this test, they believe that it is clearly EQ that is more important. As a salesperson, I believe my listening and empathy (ability to read what my prospect is feeling/experiencing during our interaction) is much more influential to my success. I think there is a certain bar you need to cross in both IQ and EQ in order to succeed in sales, but if you have to excel in one of them, I definitely pick EQ. No one would discount the value of kindness because some people abuse it, so I’m not sure why someone would do the same regarding emotional intelligence. I suppose that one could thus say that there is a dark side to IQ as well as EQ as either may be used toward one’s own self-centered ambition. The overall goal of emotional intelligence and cognitive intelligence, as I understand it, should be healthy mind development, which would certainly not include devious intentions of any kind. A) emotions and how to express them calmly, how to think before I act, how to be more considerate to other people’s feelings, and how to take responsibility for my actions. If I hadn’t have discovered these skills in 2004 I’d probably be in prison now due to continuing the aggressive behaviour I used to display whilst drunk. These skills have enabled me to refrain from alcohol since 2004 and also enabled me to address the other irresponsible behaviour I used to display even when I wasn’t drunk! B) Self-Science at the Nueva Learning Centre, and Six Seconds. Discovering the inspirational work you do in education enables me to support, encourage and show the young people I work with (and my own children) how to improve their EQ skills so they can handle some of life’s challenges in a more constructive way. Therefore, based on my experiences of discovering and subsequently applying and sharing EQ, I disagree with Mr Grant’s view that it is overrated. I would say that there’s a better book you can read far better than Goeman’s. It’s called the art of war and it will teach you, among other things, how to use other people’s feelings against them so you can win any conflict. I may, like you, disagree with Mr Grant’s view that EQ is overrated but it can’t be denied that it has a very dark side that Mr Goleman seems to forget. My dissertation was titled: “A Correlative Analysis of the Affect of Emotional Intelligence on Moral Decision-Making.” I believe we have three or more intelligences – cognitive intelligence (IQ), emotional intelligence (EQ) and spiritual intelligence (SQ). The part of a person that observes cognitive, emotional and decisions is beyond the mind of IQ. The mind cannot experience itself. A thought cannot experience its own thoughtness; a feeling or emotion cannot experience its own feelingness or emotionness. They all have to be experienced in something greater than the mind. The principle is that each thing is experienced from an energy field that is less restricted and less limited; each is always experienced in something that is greater. This I believe to be the SQ portion. This group is well familiar with EQ. The IQ appears to work and discover only in the three-dimensional realm using thought, which is beyond three-dimensional. Three-dimensional being form, two-dimensional being an image such as on a television of movie, and one dimension being a dot. Sciences (IQ) are limited to the linear dimensions (logic, reason, knowledge, science, contentual) and primarily to the Newtonian concepts of cause and effect, whereas experiential reality is nonlinear (spiritual, contextual and subjective). Phenomena are the consequence of the emergence of potentiality as actuality, a process whereby content is subject to overall context. For example, chemistry is within the predictable Newtonian discipline of science (linear content) expectation, but health recovery is greatly facilitated by the unseen power of the other dimensions of intentionality of consciousness itself (nonlinear context). I have heard the human energetic essence described as “mind, will, and emotion” or thinking, doing, and feeling. In summary, I believe all, IQ, EQ, SQ, are all of equal importance and essential in harmonizing our existence. Dr. Nate Carr, copyright: 180 Solutions, llc, 2014. By offering them ways in ‘learing by doing’ exercises through EQ & SQ issues at school or elsewhere, stress melts quickly. As a result it enhances the rate / score of Cognitive Intelligence – IQ. Imagine a marriage based on IQ with an absence of EI !!?? Certainly you better ensure you have “thought” things through thoroughly, AND you better “love” each other thoroughly. Yes, EQ can be abused, but so can be IQ! Yes we need both IQ and EQ … no doubt. Also, I think we still struggle with measuring it, especially if we are talking about self-evaluations – they simply don’t work! I find EQ to be quite complex thing … looking at it from cognitive, non-cognitive, and neurological perspective … it fulfils many functions and means many different things to many different people, and can be easily misunderstood. Well, I just thought of a comparison between the function of EI (EQ) within a person (team) and the function of a turbocharger in an engine of a car. Just like a turbocharger can boost the power of a car engine, it is proven that EI has a potential to enhance our productivity. Interestingly, turbocharger does not only increase the power of the car engine, but also, it reduces the fuel consumption while at the same time also decreases the emissions. In a likewise manner, not only that the people (teams) who effectively manage their emotions and moods have a greater chance to outperform others, but also, since they better manage their cognitive functions by wisely utilising their emotions – they spend less energy on dealing with unproductive thoughts and emotions that come with stress, fear, guilt etc …(saving fuel). In addition, people (teams) with higher EI also become less toxic to their environment since they allow its members to thrive instead of belittling them (decreasing emissions). In order to increase the performance of the engine, turbocharge pushes compressed air into the cylinder where the combustion occurs. As a result, since more air is available within the cylinder for burning, the combustion that occurs within the cylinder becomes more powerful and thus the performance increases. Interestingly, all that was needed to increase the performance was to put more air into the cylinder. Air, as a substance, is often perceived as a universal power or pure substance, being an imperative substance since we need it to live. Air’s fundamental importance to life can be expressed in words such as aspire, inspire, perspire and spirit, all derived from the Latin spirare. In a likewise manner, EI could be likened to a positive force in life, as something that can enhance our abilities and inspire others, bringing more social, intellectual and physical wellbeing into the lives of individuals, teams, organizations and ordinary people everywhere. Having said that, it should be emphasized that the EI (ability to intelligently manage and utilize emotions and moods of individuals and groups) is not more important than IQ or other performance related factors, but rather it acts as an amplifier of the same. Just as a regular car needs fuel to run – and cannot function on air only – individual minds, dyads, teams, organizations, and a society as a whole, need IQ and other performance related factors in order to fulfil their functions – and cannot succeed on EI only. In fact, one of the prerequisites for the turbocharger to function properly is that the engine itself runs well – in a likewise manner, our emotional brain needs our cognitive brain in order to fulfill its function – both parts of the brain supporting each other. As a manager, when recruiting I am looking for someone with both IQ and EQ and I ask questions around both. One without the other doesn’t work well in my world. Correction: You don’t ask questions “around” both. You ask questions ABOUT both. Can a person with grammar skills that bad really be a manager? Well, it just goes to show that a high IQ is not needed to be a leader today. The essence of health, which derives from anglo-saxon “hal”, meaning “whole”, is to seek a balanced harmony within oneself and in relationship with our physical and social environment, and our relationships. We use all of our faculties and abilities to achieve this harmonious integration. In my experience as Change Management Consultant, I can not only rely on EQ per se as I need IQ as well to build my strong business case for change considering the EQ as well. If I do not use IQ, I would never be able to construct a good busniess case for change. If I do not use EQ, I would not be able to get people “buy-in” for a change ….. So, I do need both … IQ and EQ …. Is a systemic perspective difficult to take? Why is supremacy given again to cognition over other facets? When I learn or do it is a smooth synchronize of my IQ with EQ. As a mental health professional who works with diverse groups and mental health issues (prevention to tertiary) in my two decades of work have repeatedly witnessed an interplay of cognitive with EQ. In my workshops either for children or corporate weaving of IQ within EQ has this far made “content” interesting and audience active listeners. Even now, when we are each reading these posts our IQ takes in the content and how we take it, do with the readings is much determined based on our EQ. Like Joshua rightly says “We need to apply intelligence with the discernment that comes from awareness and compassion”. Being much aware is the key so that we all function in unison “Our purpose at Six Seconds is to support people to create positive change”. I recently read an article by Sir Richard Branson in which he states: “Don’t act on an emotional response take some time to settle down and collect data instead of letting your feelings take control”. Richard Branson has intuitively been practicing emotional intelligence in its many forms all his professional life. It no accident that his companies have year in year out been rated by employees in the top 10 companies to work for. And nobody can argue with his success over a prolonged period. It goes to show that employing the principles of emotional intelligence is not a hindrance to profitability instead it is a driver of profitability. Joshua, an excellent arguments of importance of developing emotional intelligence. Indeed, people get hired base on IQ (as resume gives only information about education and places people worked, not necessarily gained required competencies) but they are not only promoted but also fired based on EQ, rather lack of it. Dr. Brad Smart had proved many years ago that the reason we have so many psychopaths as bosses is their lack of EQ skills. We are humans nor robots and from childhood to old age EQ will always be more important that IQ for our self-worth, well being and happiness. IQ is the first requirement to get into any place of work. It has been well estblished that person should not be governed by emotions while taking decisions or so as it is generated temporarily by the situation. Brain is dominated by emotions ad EQ is increased, One has to maintain the equilibrium between IQ and EQ levels to lead balanced life. I totally agree with prof.Tembhre. If your EQ is perfect, you still need your IQ to balance it. It’s not a matter of right and wrong. They need to be in balance otherwise you will know that a ball is necessary to play with and not to hit someone with it. When we reason we need our IQ and not our EQ. Our IQ helps to do the good reasoning especially if we are emotionally well equipped! I think the real issue is how broad is EQ? I have found it applied to so many areas it is diluted to where it has little value. I think it needs to either be categorized, with a very specific definition. No one can defend a topic that is so open to mis-interpretation. I find articles all the time about it , that are of little research value. Make the DEFINITION of EQ needs to be much more strict, like IQ is. IQ is what gets you into college. EQ is what gets you a job. IQ stops increasing at 18 yrs. EQ grows as you grow older and experience and learn. In my option those that underestimate EQ should have their assessment done. Then they will see how valuable it is. With great respect I wish to give my opinion. I work in neuroscience and education. In March 2015 I will open my Scientific Coaching School, my PhD dissertation in Human Resources, AIU, USA. in this research I did a survey of managers where they rated as the most important factor in their success to the Emotional Intelligence, which is what allows them to be effective leaders, motivators, synergistic and appreciated by all. Within this school to help managers improve, the first step is to stabilize emotionally because that Emotional Intelligence is a transversal skill that influence the application of other skills as happens in the case of a key point as empowerment where by internal fears decreases substantially the effective management of the leaders . On the other hand, the most important consideration when hiring someone are his values ​​because knowledge can be acquired. Remember that the strength values ​​is relative to fears therefore the loyalty can be relative and less credible, and this is stronger than IQ. With much respect for me the point of view of Mr. Grant is not correct. The above are mostly about people with high IQ. Achieving a high EQ in life is open to anyone, whereas a high IQ is not everyone’s gift!! I am so grateful for the knowledge you share and your vibrant energy when talking to us on video. May you be blessed in abundance! EQ and IQ go hand in hand. Which is more “valuable” – may depend on context and how you define “value.” But, IQ is fixed, EQ is malleable and continues to grow and evolve. In the early stages of social and emotional (SE) growth, maybe one would appear and act as Grant has described. The more developed one’s SE skills are would hopefully reveal stronger self-awareness, self-management, responsible decision making, relationship skills, and social awareness. None of us are perfect at all of these skills all of the time, and we ultimately make bad choices. But making bad choices shouldn’t undermine the value of social and emotional skills. In a nutshell…I am dismayed that this question is the subject of debate. The construct emotional intelligence (please note: EI…NOT I hasten to add any morphed/distorted version such as EQ…etc.) is worthy of advanced discourse…rather than the banal, paltry offering of Grant/Golman’s. If this sounds harsh…so be it…but in my view the the terrain of IQ vs EI is old hat…very old. Equally the dark side of EI is self evident…and thus does not need to be revisited. Time to move on! EQ has nothing to prove anymore than IQ does. Humans need both to optimize the childhood, work, parenting and life experience. Well done and thank you, Josh, for entering into this debate. It is good to see both you and Daniel Goleman adding in your measured, insightful responses. EI is an important facet of successful learning and increasingly is being recognised in educational settings. Capabilities in EI can assist students to modify their reactions when things go wrong and interrupt the learning process. The development of EI in young people is linked to academic outcomes and life success. My research in the Australian context suggests that EI scaffolding in the learning process can assist teachers to improve student learning by developing these competencies in students. Dr Carolyn Ryan, Copyright, 2014. I have gone through some responses above , it’s seem to be a great discussion. So many perspectives. WOw! What I always feel is, If I have 20 clients in front me, All of them understand the discussion so that is a part of I.Q. But few of them PARTICIPATE, SHARE, SHOW CURIOSITY, INITIATE THE PROCESS, ENJOY THE PROCESS, GIVE FEED-BACK, and try to go deep to the topic of discussion and few of them always want to reach to the end of it and also beyond the discussion in the classroom, what makes them do that? one part is of course about/ is I Q but to take every step to reach to the end needs only and only EQ. Because they are not just dealing with thinking but also with their feelings along with it. Decision making, consequential thinking, answers of why, why am I feeling so.. why am I wanting to discuss more.. every thing is connected with EQ. They go hand in hand, When I say I understood something, that means not only thoughts but also feelings as well I understood both. And the one who understand both moves ahead faster and gains success better than the one who is either not aware about the emotional content or someway avoids to give value to it.